When looking at definitions and understandings of the social and solidarity economy, one issue stands out as particularly significant. The issue of how it links to organizational (micro and meso level dimensions) and societal specificities. Whereas social enterprise also in the EMES ideal typical version (Borzaga & Defourny, 2001) is only indirectly linked to a Polanyian framework (Gardin, 2006), the notion of solidarity economy can hardly be understood at an elaborate level without reference to the Polanyian framework of plurality. Accordingly, in this paper we will first highlight the difference between adopting a social economy and a solidarity economy approach to social enterprise and social entrepreneurship. Within the framework of a social economy perspective, social enterprise is first defined through a set of organizational criteria leaving the relation to the broader and deeper issues of economy and democracy open. As a contrast to this, solidar-ity economy links the organizational dimension of a particular social enterprise to the broader political and economic framework of the particular society (Laville, 2010: 230 ff.). 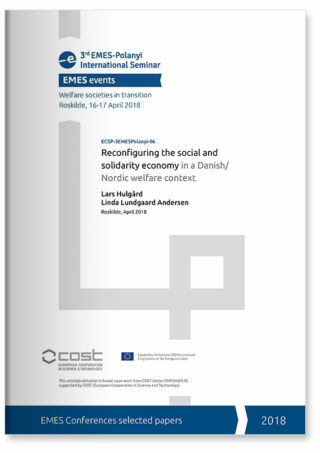 Secondly, we will present and discuss two specific social enterprises that both re-flects the diversity of social enterprise and social entrepreneurial initiatives in a Danish welfare context and provide important insights for developing theories on solidarity economy. The two initiatives differ in shape, space/geography and organizational struc-ture but are important examples of pluralism in a Danish welfare context (Andersen, 2015). Roskilde Festival and Skovgård Hotel share a number of features that place them as interesting agents of solidarity economy. They both display a differentiated activity portfolio of business; public and civil character and they display a differentiated profile of reciprocity, redistribution and democracy that place them as influential in local, regional and national/international contexts. Finally, in the concluding section we discuss how an analysis based upon solidari-ty economy differ from one based solely upon a social economy perspective, and second-ly some future perspectives for the continued evolution of the Danish/Scandinavian wel-fare model.